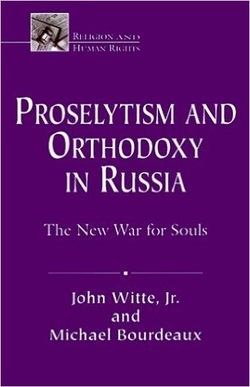 Book: Proselytism and Orthodoxy in Russia - John Witte, Jr.
Few of the struggles Russia has undergone since the fall of Communism have been fiercer than that being fought between the long-repressed Russian Orthodox Church and a host of groups seeking to evangelize the Russian people. This volume assesses the legitimacy of the Orthodox attempt to reclaim the spiritual and moral heart of the Russian people and to retain their adherence in a new, pluralistic world where many Christians and followers of other traditions seek the right to establish themselves. Proselytism and Orthodoxy in Russia also brings together the latest scholarship on the new Russian laws regarding religion as well as suggesting guidelines for foreign missionaries in Russia. Introduction – John Witte, Jr.
"Readers seeking to understand the crisis forced by Russia's restrictive new 1997 law governing churches and religious organizations will find this book's many-sided chapters an indispensable resource. Its diverse authors provide an expert, highly informative-historical and contemporary-analysis of the issues surrounding the most pressing question on religion in post-Soviet Eastern Europe: freedom of worship and belief."